Structure in AISI316 stainless steel. 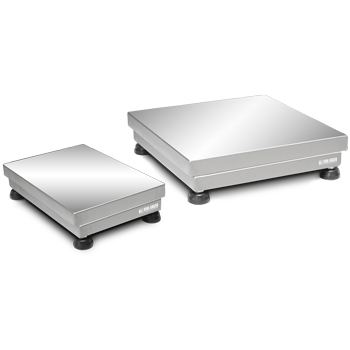 Small and medium capacity electronic platforms, having a precise and sturdy structure, are particularly suitable for all types of industrial and commercial applications in which it's necessary to work in environments with strict hygiene requirements. 6000e legal for trade version. Functions with a C6 6000e approved “single point” ALUMINIUM load cell according to OIML R60 standards with protection against dust and water splashes according to IP65 standards. Structure with tubulars, mechanics, trinkets and loading surface in AISI304 satin finish stainless steel. Fitted with adjustable STAINLESS steel feet with plastic resting surface and level. Up to 15 Vdc power supply. Shielded 3m cable with connectors, for connection to the indicator. CCATEX: ATEX certificate for each load cell. DCATEXMECH: ATEX declaration for the PLATFORM (for the load cells ATEX declaration see CCATEX-1 code). Option to be offered only if the platform is ordered without the indicator, if so, refer to the chosen weight indicator available certifications. Example of use with bracket, attached column or floor column. (*) Divisions obtainable only with the relative options, in combination with Dini Argeo weight indicator. DINICAL Connection to a Dini Argeo indicator and calibration. NET PRICE. ECEM2 CE-M single platform legal for trade multi range approval. THR High Resolution (HR) model. JB1I (S6) IP68 stainless steel single-channel junction box for 4-wire load cell cables. TIP68 IP68 connection fitted with specific cable, fairleads and connectors. CCATEX-1 Optional ATEX version for single load cell. Categories: ATEX II 1G Ex ia IIC T6 (Ta -20÷+40°C) TX (Ta -20÷+65°C) Ga and ATEX II 1D Ex ta IIIC TX°C (Ta -20÷+40°C) TX°C (Ta -20÷+65°C) Da IP65. Complete with manual and ATEX EU CONFORMITY DECLARATIONS (available in EN, DE, FR and IT). DCATEXMECH DCATEXMECH: ATEX declaration for the PLATFORM / LOAD CELL ASSEMBLY KIT (for the load cells ATEX declaration see CCATEX-1 code). Option to be offered only if the platform is ordered without the indicator, if so, refer to the chosen weight indicator available certifications. TCBI350-1 Stainless steel column h=350mm with stainless steel fixings. Fitted with bracket for DFW, DFWL, DFWLI, 3590E, CPWET, TRI, DGT20 and DGTPK series weight indicators. NOTE: on the TS and TTE platforms it's possible to mount only DFWL, DFWLI, TRI, DGT20 and DGTPK. TCBI500-1 Stainless steel column h=500mm with stainless steel fixings. Fitted with bracket for DFW, DFWL, DFWLI, 3590E, CPWET, TRI, DGT20, DGTPK series weight indicators (not compatible with TSE and TTE platforms). TCBI700-1 Stainless steel column h=700mm with stainless steel fixings. Fitted with bracket for DFW, DFWL, DFWLI, 3590E, CPWET, TRI, DGT20, DGTPK series weight indicators (not compatible with TSE and TTE platforms). CSP38I-1 Stainless steel column 450x450mm, h=917mm, Ø 38mm. For the indicators of the DINI ARGEO and SCALE HOUSE range. CSP38 Stainless steel column 450x450mm, h=917, Ø 38mm. Painted steel base. For the indicators of the DINI ARGEO and SCALE HOUSE range. CSP38D Stainless steel column 350x350mm, h=750mm. Painted steel base. For the indicators of the DINI ARGEO and SCALE HOUSE range. PBSTF Stainless steel fixing bracket for mounting the DFWL indicator. TB60I-1 Stainless steel cart for 400x400 or 400x500mm platform. Surface h=235mm. Only for T/TE, T C6 and TE C6 series platforms. TB60IEX-1 Stainless steel cart, Ex II 2GD IIC, for 400x400 or 400x500mm platform. Loading surface h=235mm. Only for T/TE, T C6 and TE C6 series platforms. TB60BI-1 Stainless steel cart for 500x500mm platform. Surface h=260mm. Only for T/TE, T C6 and TE C6 series platforms. TB60BIEX-1 Stainless steel cart for ATEX zones Ex II 2GD IIC mark, with low supporting surface, for 500x500 mm platforms. Height of the loading surface: 260mm. Only for T/TE, T C6 and TE C6 series platforms. TB300I-1 Stainless steel cart for 500x600 or 600x600mm platform. Surface h=260mm. Only for T/TE, T C6 and TE C6 series platforms. TB300IEX-1 Stainless steel cart, Ex II 2GD IIC, for 500x600 or 600x600mm platforms. Loading surface h=260mm. Only for T/TE, T C6 and TE C6 series platforms. TA60I-1 Stainless steel cart for 400x400 or 400x500mm platform. Surface h=670mm. Only for T/TE, T C6 and TE C6 series platforms. TA60IEX-1 Stainless steel cart Ex II 2GD IIC, for 400x400 or 400x500mm platforms. Loading surface h=670mm. Only for T/TE, T C6 and TE C6 series platforms. TA300I-1 Stainless steel cart for 500x600 or 600x600mm platform. Surface h=680mm. Only for T/TE, T C6 and TE C6 series platforms. TA300IEX-1 Stainless steel cart, Ex II 2GD IIC, for 500x600 or 600x600mm platforms. Loading surface h=680mm. Only for T/TE, T C6 and TE C6 series platforms. TPBEI Stainless steel plate for scale or labeller support for TA or TB carts. SGAQI-1 Stainless steel frame for 400x400mm platform. Loading surface h=600mm. SGAXI-1 Stainless steel frame for 600x600mm platform. Loading surface h=600mm. CT3 ISO 17025 calibration certificate up to 5 kg. 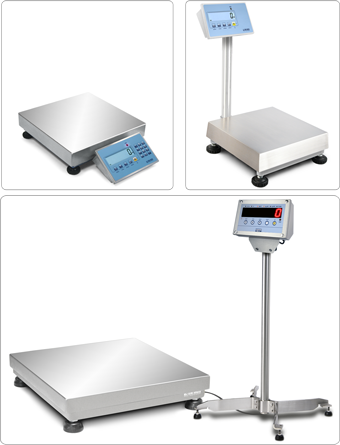 For precision and industrial scales, crane scales.